A notable aspect of the feast is the use of ornate dishware for the occasion. While morning coffee or tea may not be the first image conjured by the word “feast,” the decoration of a coffee or tea cup may be just as revealing of the occasion of its use and the social class of its users as dinnerware suited for a full meal. Decorated dishware was once something that was likely only possessed by the wealthy, but with advancements in manufacturing, such pieces became easier to mass-produce, requiring investigation of the particular object to make assumptions of who may have used it. 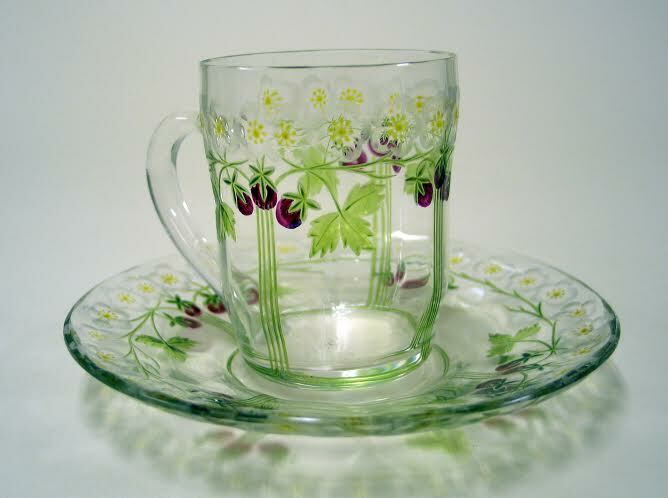 The cup and saucer set is comprised of clear glass with strawberry fruit and leaf designs around the circumference of both the saucer and the mouth of the cup, with small yellow-green flower details. It was made approximately in the year 1905 CE, and is attributed to “Steinschönau,” a city in the former Austro-Hungarian Empire. The region, also known as “Bohemia,” was a well-known source of clear glassware since the early 18th century because of their discovery of a much higher quality type of glass. Once the glass had been blown, crafters would engrave, paint, or add gold leaf to the pieces. By the time of the cup, the glassworkers had moved into mass production. The middle class were then capable of purchasing decorative glassware, and could use it for special occasions to create a more upscale appearance than that allowed by plain glassware.